Black Powder in Coulee Country. Matt had a leftover turkey permit for this week for our part of the state, since he didn’t make it up north to hunt. We only made it out Sunday morning, and heard the birds, but didn’t really see any. For all that the weather is more comfortable for turkey hunting in May, the whole, light-at-4:45 bs is a bit too much for me. I’m happier being chilly in April, but able to sleep until 5:30. Speaking of sleeping, I’m low enough on sleep this week from work and also waking up at 4 to turkey hunt that I managed to literally pass out while sitting this morning. I was getting some micro sleeps, so I re-positioned to being propped on my elbow on the ground. I woke up 30 minutes later curled in a ball on my side, head pillowed on my pack. I must have needed it. So, since I was so tired today, but sick of not eating at home (dinner at work everyday. 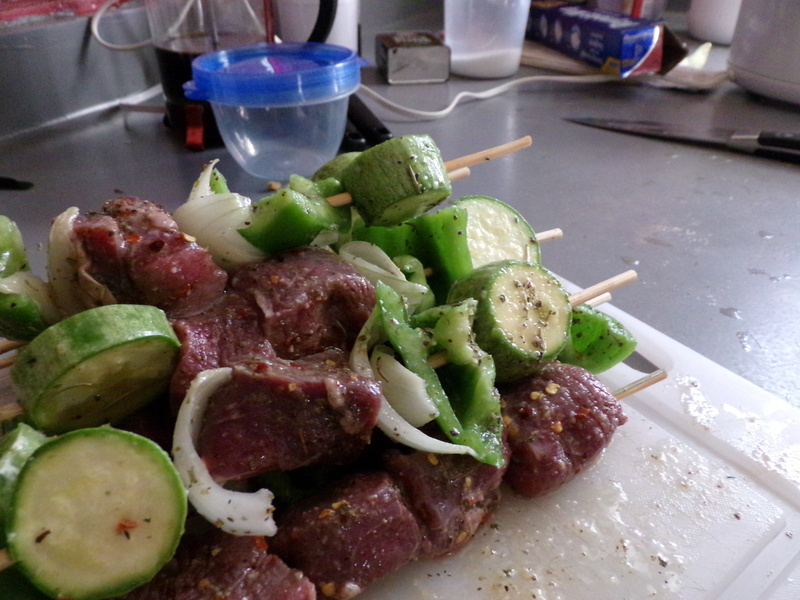 Yeesh), I threw together these awesome, quick cooking venison kebabs. Also fulfilling my personal goal of eating more veggies. 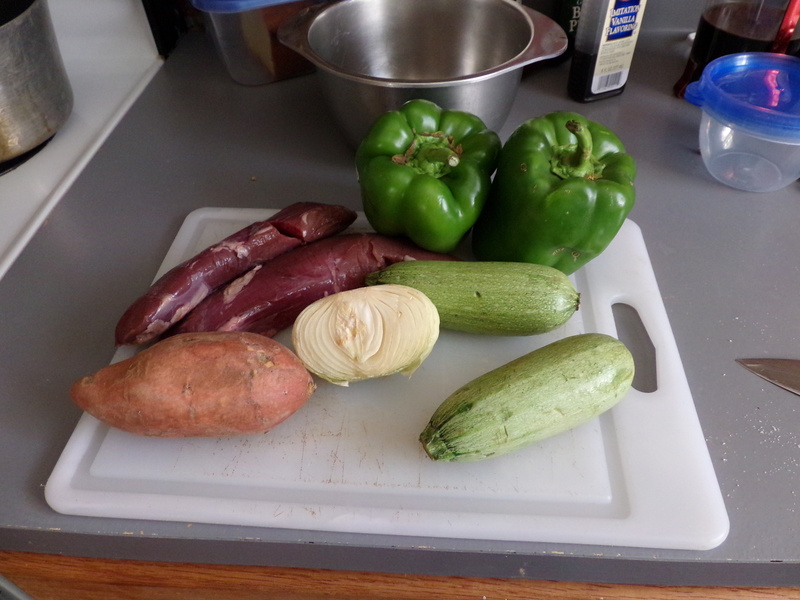 The small, long muscle from a hindquarter, squash, onion green pepper. 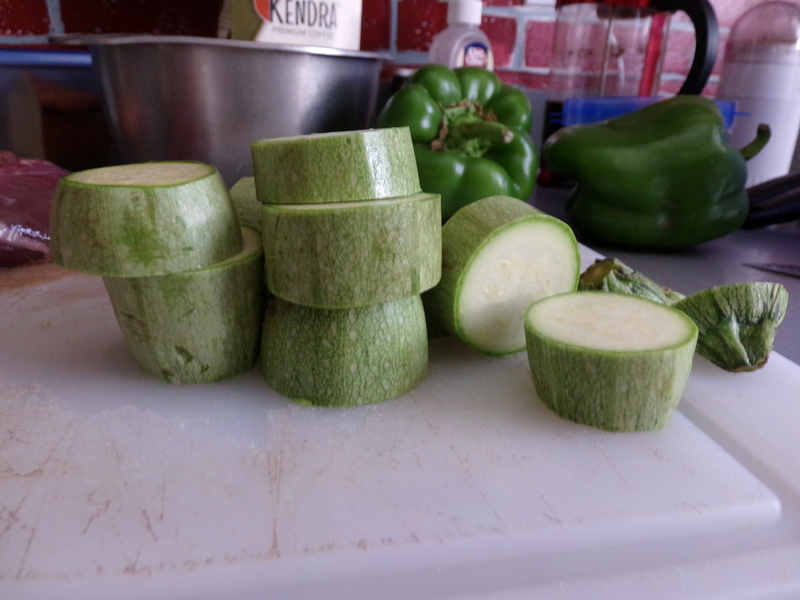 I keep them round, but I’ve seen it done up pretty fancy as a zucchini ribbon. 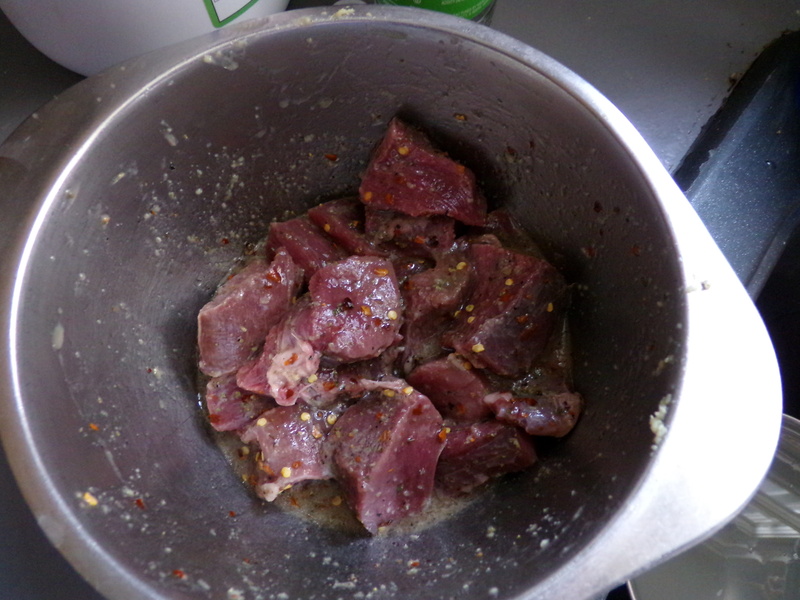 Meat cubed and in a marinade: apple cider vinegar, garlic, salt, pepper, red pepper, and canola oil. 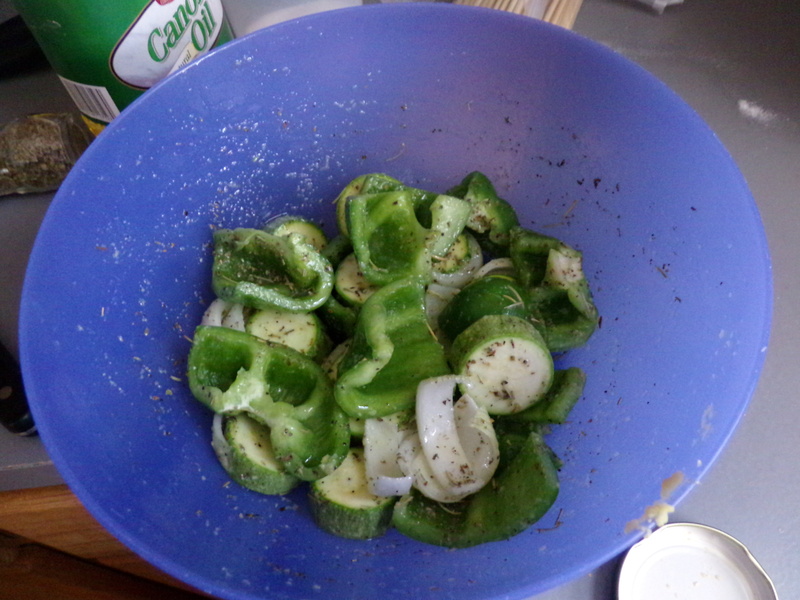 Veggies cut up in their marinade- salt, pepper, marjoram, garlic, rosemary, lemon juice and canola. Place on a piping hot grill. Cook ’em until the veggies are just charring a bit. Tasty, fast, and they’ll be good cold on a salad later this week. I had mine with a roasted sweet potato. 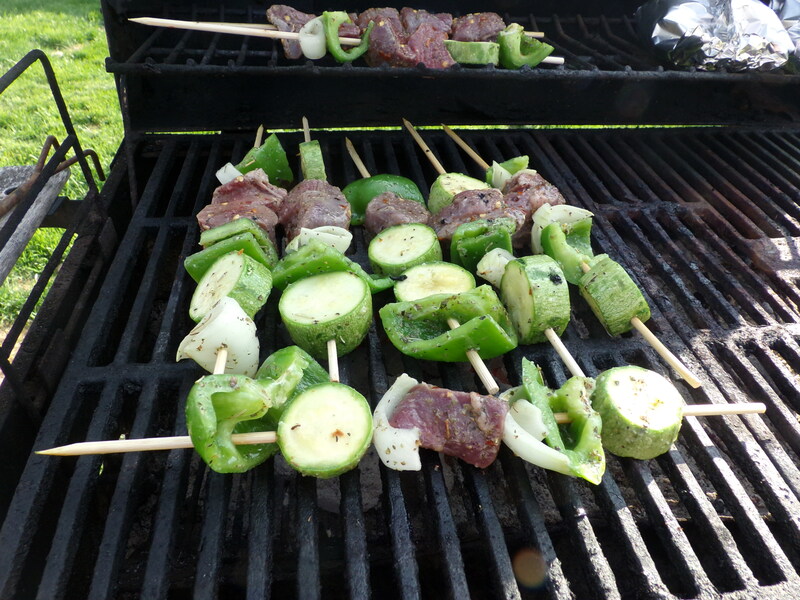 Matt got his own meat-only skewer. I’m so glad the weather’s warmed up enough to grill comfortably. 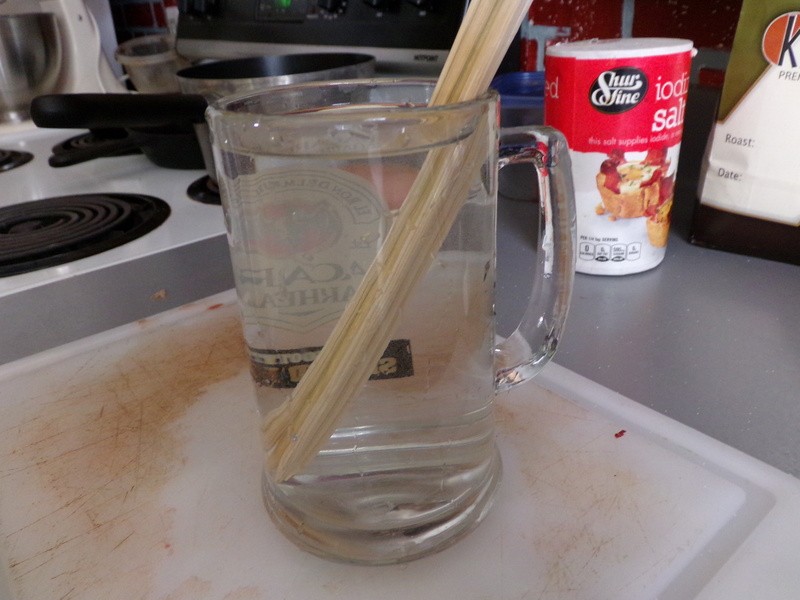 A few years ago, before I made the move to Madison, I went through a major DIY food phase. I lived by myself and hung out with my good friend The Chef quite a bit. Food blogs like TheKitchn and SmittenKitchen, among others, played a big part in my foodie phase. I taught myself to make yeasted bread (stollen, challah, sandwich), to brown butter, to make jam and candies (blackberry jam, salted caramels, divinity), and a number of other foods (puff pastry (never again), cream soups, cheesecake, yogurt, wine). In fact I’m pretty certain this food phase is part of what convinced Matt to ask me to move up here. Anyhow, in the three years and some change since I moved to Madison, my cooking adventures have tapered off some. Work and school and things get in the way, and suddenly tackling a huge cooking project just to say I did it doesn’t sound like as much fun as it used to. I’d have to do dishes and wipe the counters and honestly probably mop. And don’t even get me started on getting rid of the products of such endeavors: we don’t need that many cakes/cookies/home made caramels/whatevers lying around. They don’t mesh well with strength training. I do still cook (obviously), and I still read those blogs. So last week, when this recipe showed up at Smitten Kitchen, I knew I had to try it with some ground venison. So I picked up mint and feta, and away I went. I followed the recipe exactly, except for the sub of ground venison for ground lamb. Of course it’s from Wisconsin. Everything in the mixing bowl. 1st batch of browned meatballs. Simmering the meatballs in the sauce. Over orzo pasta with feta and mint garnish. This was excellent, and it made a ton of food. I have enough left over for lunch the next couple days, and it should reheat pretty well. It was a good, quick-together meal for a week night. The longest part was rolling out the balls themselves, all together it took about 45 minutes to prep, and I was moving slowly and disorganized. Opa! The other day, we had a cookout. Our local Hy-Vee’s meat department makes their own bratwursts. 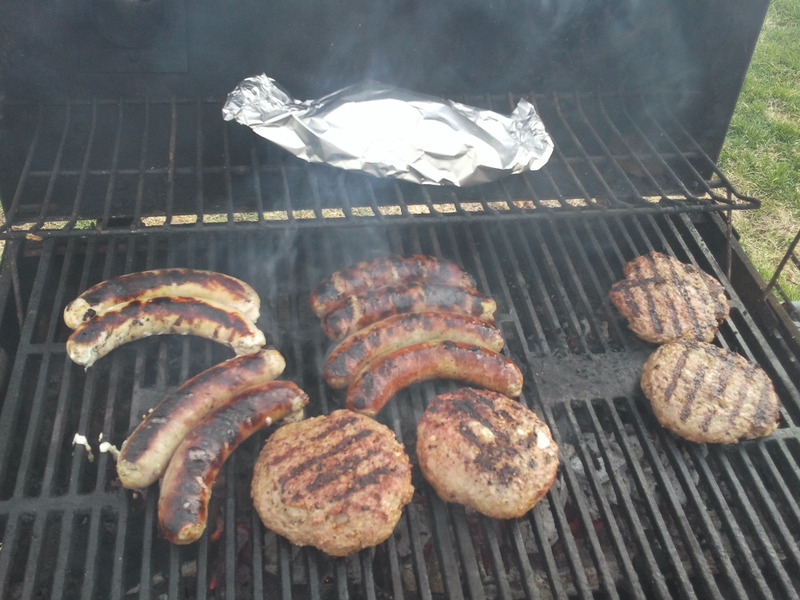 They have your standard Wisconsin fare: bacon and cheddar brats, bacon-cheddar-jalapeno brats, and beer brats. The pineapple pork brats and green onion brats are two of my particular favorites. 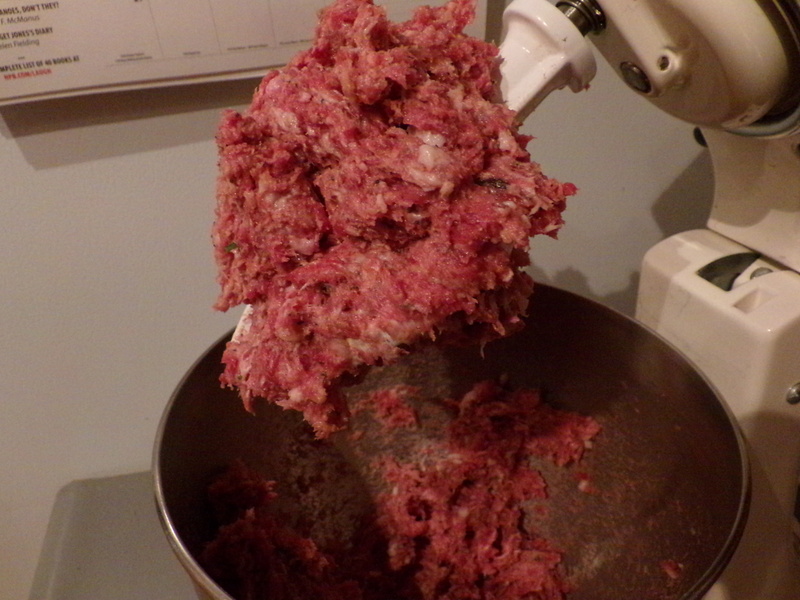 But on this day I also ground up some bacon end fat I had reserved just for this occasion, and I made deer burgers. Last time I made deer burgers, things went a bit… awry. I made up the patties and did not take my eyes off of them except to close the grill. Sorry, dog. No deerburger for you. You see, I made my burgers up with something special this time. I can’t have cheese really, but Matt loves it. 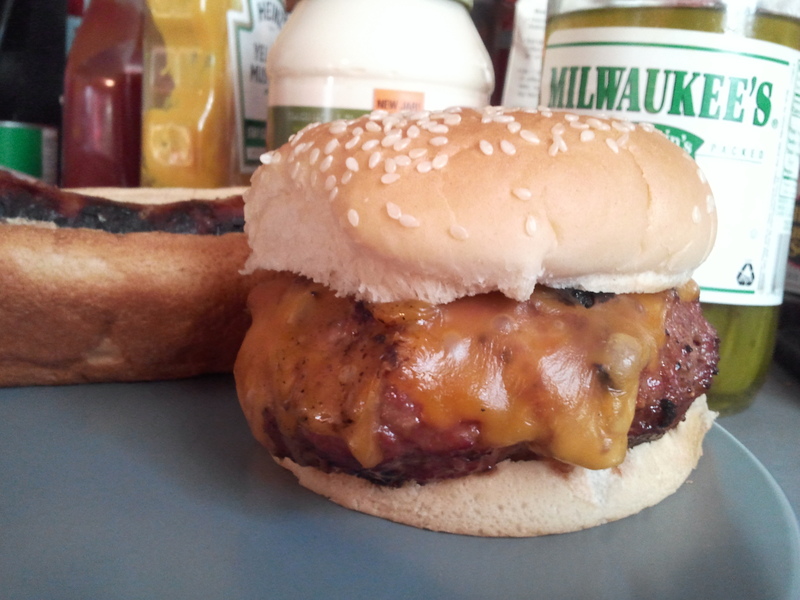 I made him surprise cheese-curd-stuffed-cheddar-cheese-topped-Wisconsin-Burgers. 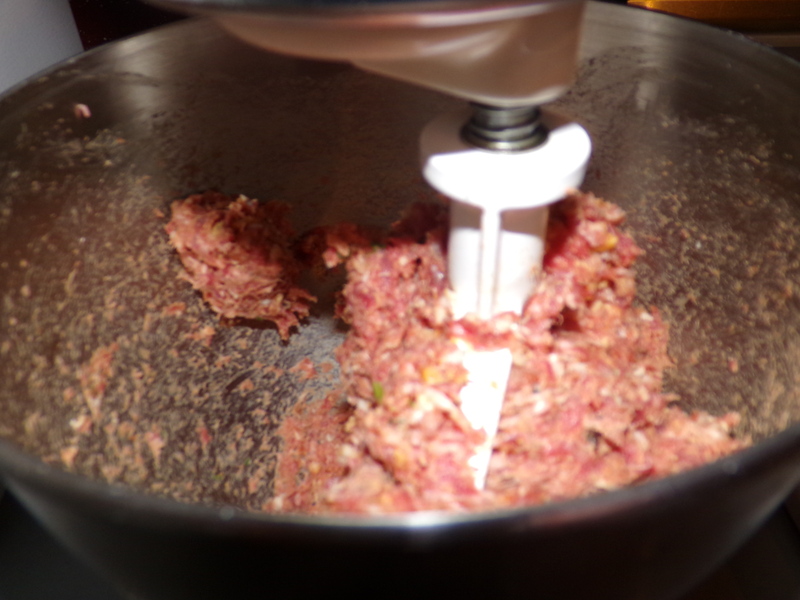 No prep pictures, as handling and grinding cured hog fat means no camera touching. Matt ate two brats and about half the burger, plus a few bottles of Hacker-Pschorr, and declared himself nigh unto bursting. We had a bonfire later that night & his buddy bill polished off the second Wisconsin Burger, along with his half a case of Mickey’s. 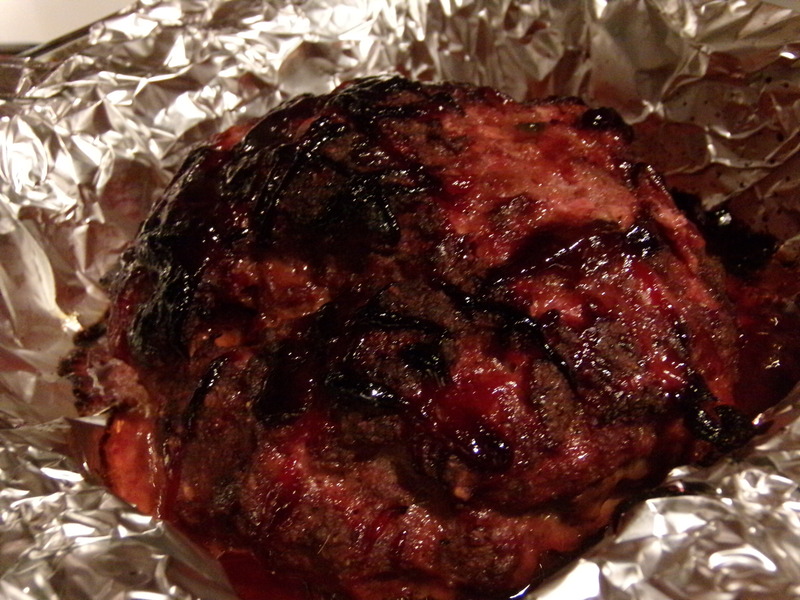 Wild Comfort Food: Venison Meatloaf. We ground our venison last Fall. 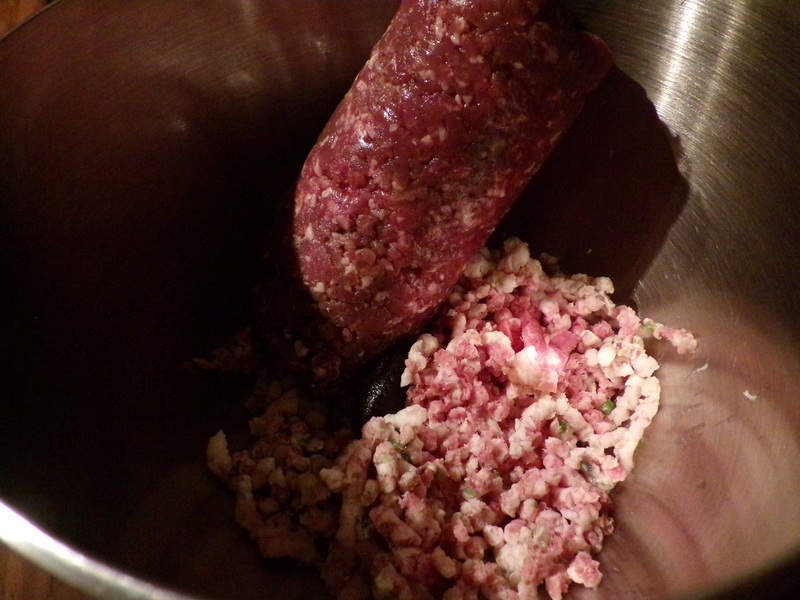 But we never got around to cutting it with ground pork like we normally do. Since we also haven’t bought a sausage stuffer that’s worth a damn, I’m not sure we’ll ever get around to it. This is sounding a lot less like a problem, though. 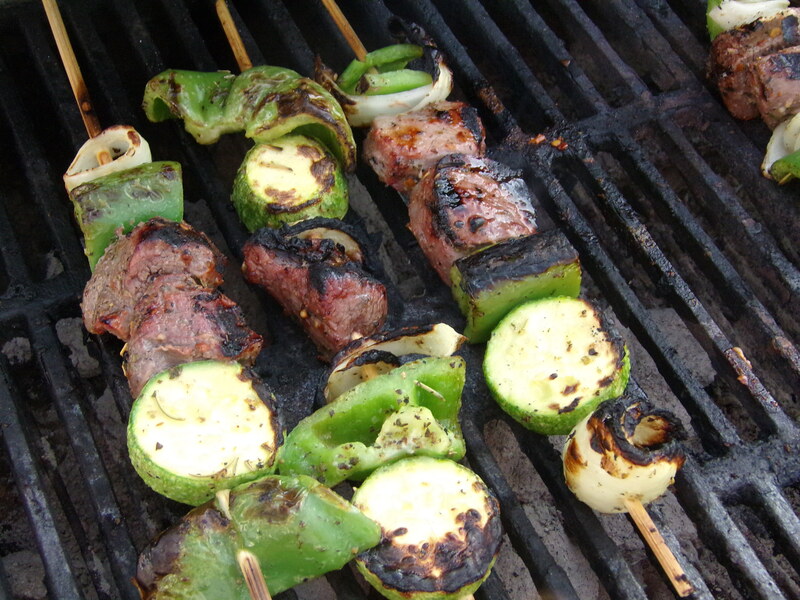 Plain ground venison is pretty versatile. I came home from work around 7, and had this thawed pound of deer meat. I ground up a packet I’d separated of really fatty bacon ends, and then mixed the venison, an egg, some Ritz crackers, and some seasoning in my (new!) Kitchenaid. Then I formed it into a round and baked it in a foil-lined pan. Kitchenaid made short work of it all. Hot from the oven. After I dropped a potato on it, of course. It came out extremely well. 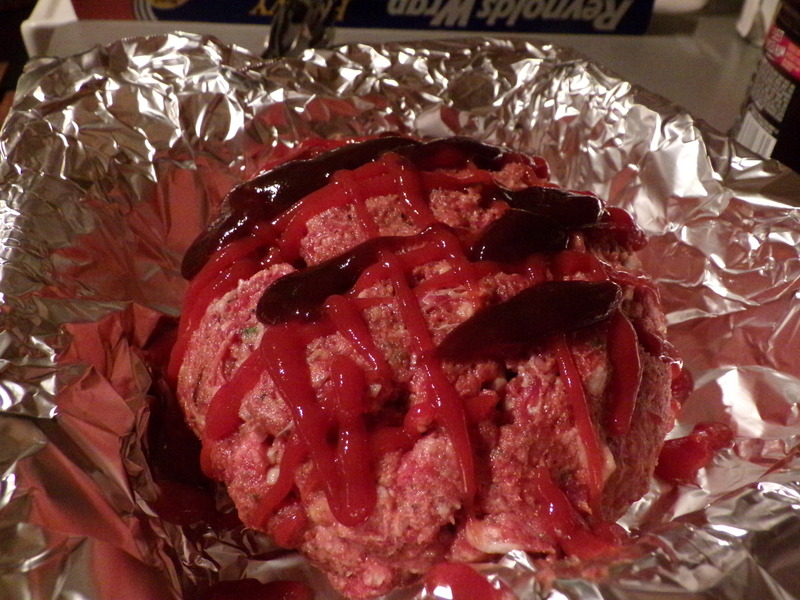 I don’t know what that kid in A Christmas Story was complaining about- meatloaf is delicious. My mom would be proud. I haven’t written a post in over a week. With most of the seasons we’re interested in closed, and weather that’s making getting out on the ice to at least chase panfish seem iffy, we’ve spent the last weekend or two mostly relaxing and starting to get the house in order. Case in point- I spent Saturday scooping all the dog poo out of the back yard (two hours and 5 garbage bags. yikes), and then Tuesday afternoon cleaning up the front yard and porch. Random litter, sticks, sweeping, and everything else I could manage with the ground being pretty frozen still. With a wedding in Minnesota to attend this weekend, I don’t really know how much else we’ll get up to. I set out a side of venison ribs Tuesday afternoon for dinner. Believe it or not, we’re getting down to the end of our venison. There’s a few steaks left, two football roasts, and two more packages of ribs, in addition to some packages of bones to make into stock. I’ll have to start stretching the venison with store bought chicken, pork, and maybe even beef. The ribs I intended to grill. I figured they’d be tough, though, so I cooked them in foil in the oven for a few hours first. I made a short marinade inspired by a recipe for Korean beef short ribs. They were only in that for about 30 minutes before I sauced them with some altered barbecue sauce (Ray’s with some “Saipan Sizzle” nonsense Matt had lying around, some ginger, and sesame seeds). They cooked for a good long time in there until I had coals in the grill (2-3 hours), then another hour in the packet on the grill, and then I sauced them some more, and let them char a bit over the coals. After. I could have gotten more fat off. I had not lit the grill in about 6 months. In the end, they were pretty tasty. But the next incarnations of deer ribs, I will be sure to trim every bit of fat off- it definitely has an off flavor, even in small amounts. I’ll also wrap it in some bacon ends before cooking. But it did look pretty impressive on my plate. These were from the smaller, younger doe so they were still pretty small. The ones from the bigger doe will be larger and meatier. Verdict: Barbecued deer ribs will make you feel like a cavewoman (or man). I finally got around to making this recipe back on Monday. I intended to post it on Tuesday morning, but with class, homework, and my dad visiting I didn’t get much of a chance until today. I had made that chili that was inspired by the recipe, but Monday I finally remembered to set out a venison shoulder to thaw. I forgot to take pictures of my process, but it was the larger shoulder of the doe Matt shot. Judging by the 4 1/2 (!) hours it took to cook the shoulder to shreddable consistency, I would say that doe was probably 3 or 4. 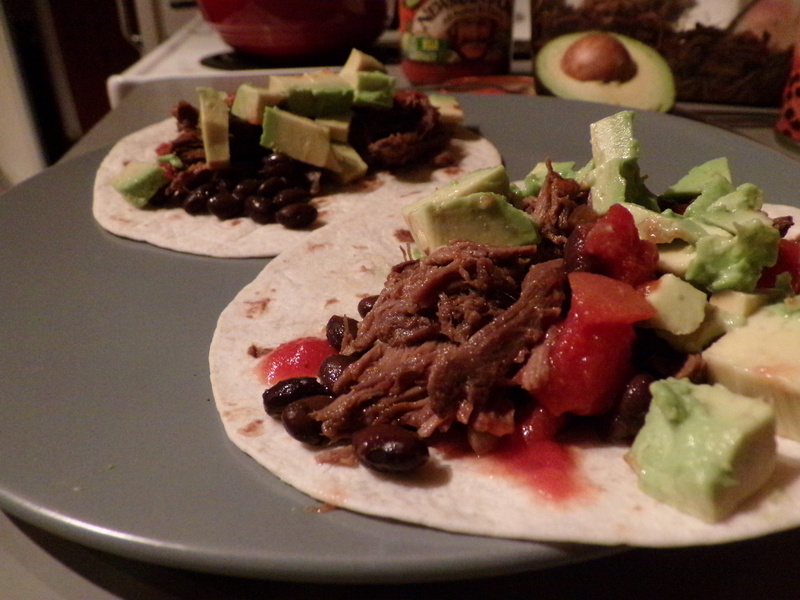 But the end result was every bit as good as promised- it tastes like Chipotle’s Barbacoa. 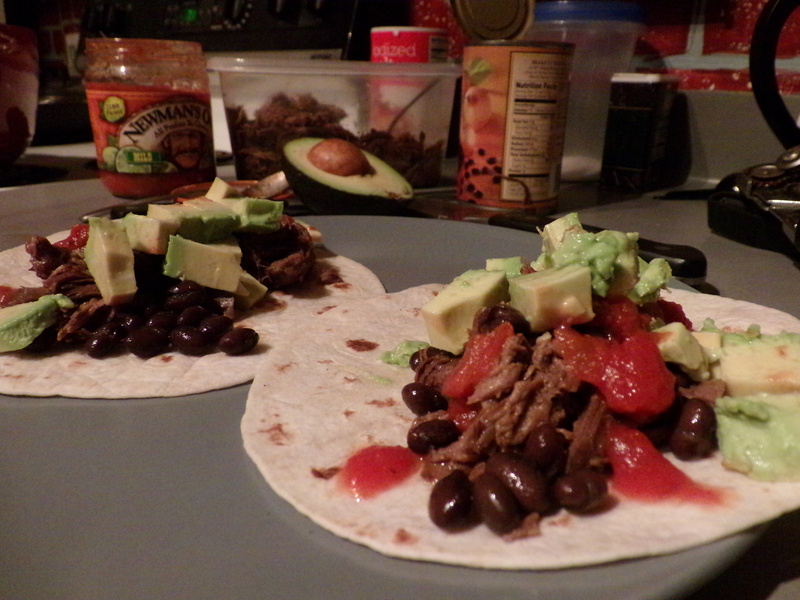 I typically go for their Carnitas myself (I will never not love pork), but for at home? This was the stuff to make. In other news that’s not enough to make it’s own post, Matt’s bear hunt is already set up. I went through 4 guide services that were already booked solid. Apparently, the notifications showed up on the DNR website about a week or two before the mail went out. Something to keep in mind when I get my tag. We’re going with Oak Ridge Guides up in Weyerhaeuser in Rusk County. That guide has an all-inclusive camp- lodging in cabins, hunts over baits, and food through the entire stay. That particular area is kind of keyholed into zones A & D, which I think should give him a better chance of getting a bear. Sadly, I don’t think I will be able to make it up with him- their price for spectators is only an additional $250 which is pretty reasonable. His hunt runs Wednesday-Wednesday, September 10th-17th. Even if he’s only up there for 2 or 3 days, that’s the second week of the Fall semester, and it will be that part of the busy season at work where it’s still hot out & business is booming, but a ton of employees have left for college. That time last year we were horribly short staffed, and they were trying to keep us on a 30 hour a week cap. We can still let the guide service know if I change my mind in a week or two. After tonight at work, I’ll know whether or not there are any big events that weekend at work.